In the past, the only way to cover an unattractive front tooth was with a crown. While crowns have come a long way and aren’t as easily spotted as they once were, there is an even more aesthetically pleasing and less invasive option: porcelain veneers. Porcelain veneers, also called porcelain laminates, are thin shells that are placed over the front surface of the teeth to improve their appearance. To perform the procedure, Dr. Denes will first remove a small portion of enamel from the tooth and then make an impression of that tooth. A dental laboratory will construct your veneer from this model. While your permanent veneer is being made, you may wear a temporary one to protect your teeth or hide imperfections. After your veneer is constructed, Dr. Denes will make any adjustments needed to make sure it fits your tooth correctly and then bond it onto your tooth with a special type of dental cement. The result is straight, white, beautifully shaped teeth in two weeks or less. They are stain resistant, unlike other types of veneers, and they have a more natural appearance than crowns. 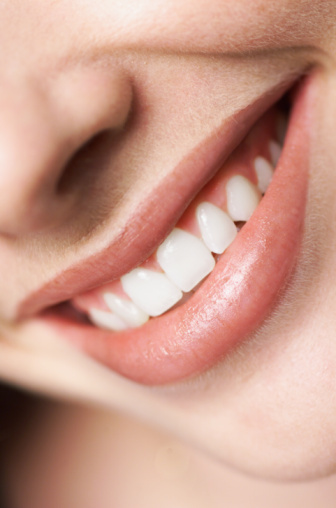 You can choose the shade you want to make discolored teeth appear whiter. Your gums tolerate the materials well. Unlike crowns, which require a considerable filing down of the tooth to make room for the crown, veneers require less tooth removal before they are placed on the tooth. The procedure is more comfortable than getting a crown. Sometimes a root canal is needed for a crown, and the temporary crown is uncomfortable. Neither the temporary nor permanent structure for veneers causes discomfort. However, those with tooth decay, gum disease, or those who grind their teeth at night may not be good candidates. Only Dr. Claudia Denes and Dr. Alex Denes can tell you if porcelain veneers are right for you. If you’re unhappy with the appearance of your teeth and would like to discuss your cosmetic dentistry options, call Drs. Denes and Denes today at (559) 297-1800. Fresno Dental Studio serves patients in Fresno, Sanger, Mendota, Orange Cove, Reedley, Selma, and the surrounding areas.